Sidonie Gillette poses with Chelsea Clinton after an October interview. Scholastic Press Corps website photo. 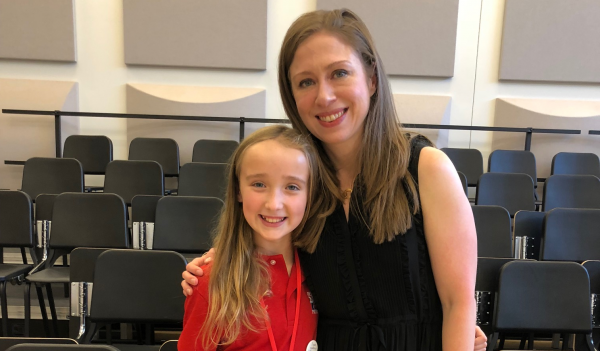 While most incoming sixth-graders this fall were worrying about memorizing their new locker combos, Sidonie Gillette was fretting about whether she’d successfully land an interview with Chelsea Clinton. Gillette, a student at H-B Woodlawn, was recently selected to serve in the Scholastic News Kids Press Corps—a news outlet written “for kids, by kids” ages 10 to 14. As one of only 45 students chosen for the prestigious honor, she beat out more than 500 applicants nationwide to land her coveted spot in the corps. She will spend the next year contributing reported pieces to Scholastic Magazine and its corresponding website. Together, the brand’s print and digital platforms reach more than 25 million students worldwide. At 12, Gillette isn’t old enough to vote, but her most recent work included extensive research (and coverage) for the close midterm elections race in Virginia. Gillette is already doing just that. An avid reader and political activist, she attended last year’s Women’s March in D.C., as well as the February “March For Our Lives,” which advocated stricter gun laws in the wake of the Parkland, Florida high school shooting. “I enjoy reading books that teach me about issues in the world,” she says, noting that her interest in politics intensified after the 2016 presidential election. So it’s perhaps no surprise that Gillette plans to zero in on politics as her typical beat. “Sidonie’s gotten old enough that the news goes uncensored in this house…and the news is pretty interesting,” says her mother, Georgia Gillette. What does it take to land a job in the Scholastic News Kids Press Corps? Prior to securing her spot as an official reporter, the pre-teen launched her own blog, Sidonie Says. It also helped that she is a longtime reader of Scholastic Magazine, notes Megan Stack, Gillette’s former fifth-grade teacher at Burgundy Farm Country Day School. Stack encouraged Gillette to apply to the program and coached her on the application (for which Gillette wrote a sample report on the Girl Scouts’ STEM program). When she’s not writing, Gillette enjoys swimming, reading, sewing (she’s hand-made a few of her own outfits) and learning Spanish. She hopes one day to become a political writer for Teen Vogue, where she can inform and inspire other young people to be active and in-the-know when it comes to politics. It’s safe to say she’s well on her way. Keep up with Gillette’s local and national political coverage on the Scholastic News Kid’s Press Corps website.